After a very difficult weekend pain wise I packed myself off to the hospital on Tuesday for a set of ultrasound scans on my hands and wrists. Unfortunately I wasn’t as half as bad as I had been just 24 hours before, but these things happen. The scans were done with a little mobile type unit, and it was fascinating to ‘see’ inside my own body. b) I *categorically* don’t have any type of arthritis. Now, while *I* knew that, it’s nice to have medical conclusive proof of that. It was once we moved onto my wrists that things got interesting – or “odd” in the words of the doctor. What she discovered was signs of blood underneath/behind the Extensor carpi ulnaris tendon. Don’t panic – blood at this point could just be a sign of inflammation in the syvonium (that is to say the ligaments that hold the tendons of my wrist in place). The extensor carpi ulnaris is responsible for moving the wrist to the side (towards the little finger) – the Dr says this could be a sign of Tenosynovitis. This would be the cause of the pain in both wrists and my thumbs – but doesn’t explain the different pain I’m getting in my fingers and palms. However, due to the equipment being used she couldn’t be sure, so she has gone to my official consultant and is recommending I’m referred to the Radiology department for a ‘better’ scan (I don’t know if that is an Ultrasound or an MRI) – however she did say that with the better equipment if they see anything they can give me a corticosteroid injection on the spot to see if that targets the inflammation and helps with the pain management. Thanks to everyone for all your messages of support on this, it means a lot even if I can’t always type to reply! While I got a few days of what currently constitutes ‘normal’ for my hands last week, this week they have been particularly difficult. I’ve got a date for my scans though – next Tuesday evening, so I’m hoping something comes from those. b) the pure *genius* that was the Olympic Flame Flower. Ravelry is having it’s own simultaneous competition, in which individuals challenge themselves in a variety of fun events. For myself I leapt into the lead during the opening ceremony by entering the Frogging Trampoline and finally frogging my beaded cape which had been lying since March 2011 look at me accusingly. 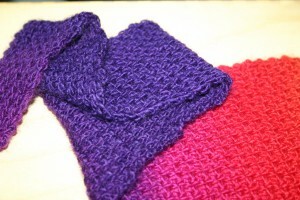 I loved the pattern, but I’ve finally had to conceed that the yarn I was using didn’t want to be that project. I’ve already got my medal for that! I’m also trying to finish my ‘Jan Sweater’ (as part of the WiP Wrestling, or I could put it in for the Sweater Triathalon though the yarn itself is about a week too young to qualify for the Syncronised stash busting as I bought it at KnitNation last year). A jumper for all seasons? I’m thinking of renaming the project from ‘August Sweater’ to ‘Calendar sweater’ as I have now being working on it longer than a year! This is the sweater I’m doing in the Portuguese method of knitting (which is great for my hands) and I’m really enjoy it. I particuarly love the fact that every time I pick it up I am reminded of the meeting I gatecrashed to meet a fabulous group of people – including strikstrik who taught me the method, V (who has been mentioned previously) and *the* Stephen West! Gosh, I’ve just realised how involved KnitNation 2011 is in my choices – the yarn, the techniques, the people!